Puppy Cost: The cost of a SwissKiss puppy is $2500; discounts for military and veterans. Puppy Application: The first step in getting a SwissKiss puppy is to complete our Puppy Application. We don't keep waiting lists for puppies. All applications are carefully considered regardless of when they are received. We're not looking for the first homes for our puppies, we're looking for the best homes! Come to Visit Us! We require meeting potential puppy owners in person before placing a puppy if at all possible. This requirement may be waived for current or prior Swissy owners. Approved Homes: We approve homes for our puppies based solely on our judgment of what we feel is best for the puppies. We will notify you if you've been approved to receive a puppy. At that time, we require a $250 deposit to hold your interest in a puppy from a specific litter. The deposit is refundable if we end up not having a puppy to place with you but is not refundable if you change your mind and decide you don't want a puppy. The deposit is applied to the cost of your puppy when we place a puppy with you. Come and Play with the Puppies! 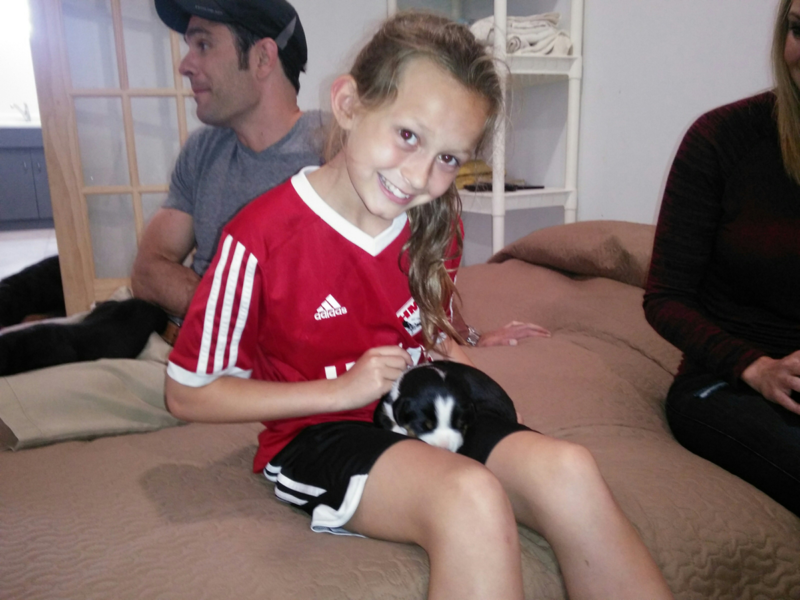 We encourage you to come and play with the puppies as often as you'd like and we love to have children visit. Sometimes a new mother is a little wary of visitors during the first 3 weeks, but she's just protecting her babies. The mama is usually more relaxed after puppies are about 3 weeks old. Placement of Puppies: We will promise new puppy owners their choice of gender, either a male or female puppy, but do not actually commit to placing a specific puppy with a specific family until the puppies are 8 weeks old. Eight weeks of age, plus or minus 3 days, is a magical time for puppies. At that point in their life, their structure is what it will be when they mature. Before 8 weeks, they're not developed enough to assess structure and after 8 weeks, they go through a growing stage during which their structure constantly changes and goes through awkward stages. Eight weeks of age is also the best time to evaluate the temperament of each puppy. 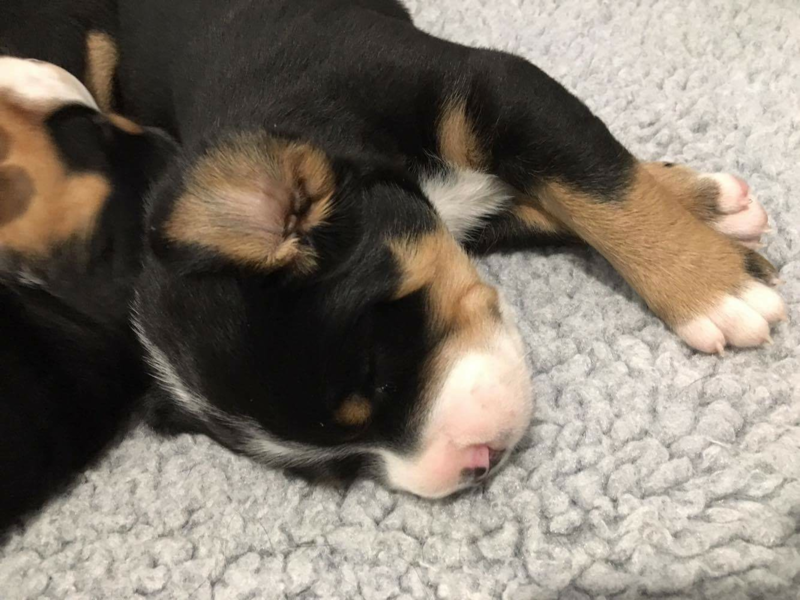 The puppies natural temperament, whether it be easy-going, robust, or somewhere in between, is influenced by genetics and by the environment in which he/she is raised during the very important first 8 weeks of life. ​We place puppies in their homes right after the puppy evaluations based on matching the expectations of each puppy owner to the characteristics of each puppy. For example, if someone wants a show quality puppy, we will look for the puppy with the best show potential. If someone has young children, we will look for a gentler, more easy going puppy. A puppy with an exuberant, robust personality would be placed with active adults and families with prior Swissy experience. Amazingly, it always works out that everyone get the puppy they wanted! 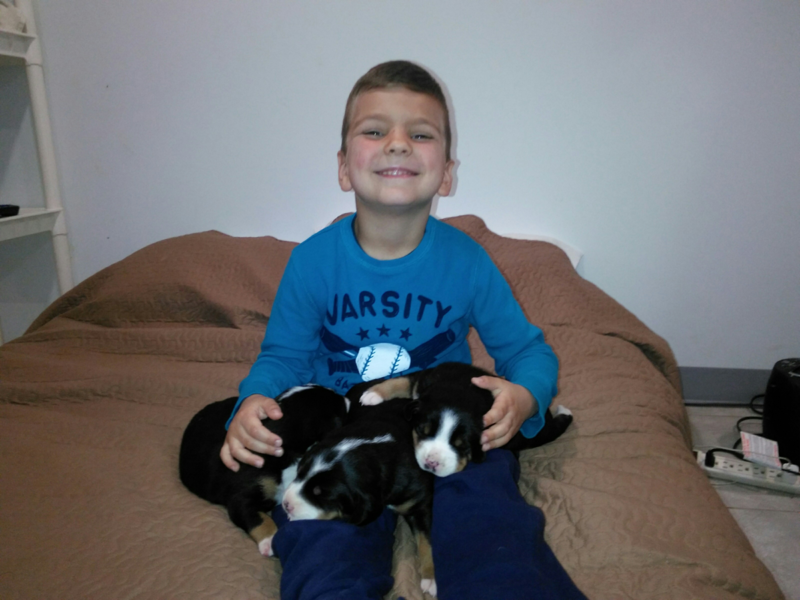 Puppies will go to their new homes between 8 and 9 weeks of age. If you're receiving one of our puppies, we'll ask you to choose a registered name for your puppy based on the theme for the litter. Of course, the everyday name that you use for your puppy at home can be anything you want it to be. We'll require a signed contract and payment in full before you take your puppy home. You'll receive the contract in advance of the date you get your puppy so you have time to fully understand everything and ask any questions you might have. A Puppy Manual with photos of your puppy from birth to 8 weeks and quick-reference information for new puppy owners. We take raising puppies VERY SERIOUSLY!